October Already?? New Orleans, Chilly Weather, Pagan Pride and Big News! I’m not quite sure how it’s been almost a month since I posted last! Wow, so much to catch up on. First is the awesome trip to New Orleans/ Baton Rouge I got to take the third weekend of September. We had a great time with one of our couple friends on the four day weekend and I got to meet Cyndi Cyreigna Elliott of Irie Tribal Dance Company and take a workshop with her as well as perform in the hafla afterwards, buy a new Bindi, drool over the rest of her costuming bits and pieces and see the wonderful place that is New Orleans. It was rainy for a lot of the trip and the day of the workshop, rain cozily pitter pattered down as we had class in the mst beautiful yoga studio. Cyndi is a masterful teacher and extremely fun to boot! I also got to enjoy a fun lunch with my sisters from Wild Sky Tribal and eat some yummy Jambalaya and Boudin Balls! It really was a great trip, I got to see swamps and LSU and the Saints were victorious in their respective games so I had a happy fiancee! The next weekend, on the 28th my lovely friend and student Zahra organized a private group class in Savannah, TX that I went down and taught and I had a great time with some very fun ladies, and the studio was absolutely beautiful! On the 3rd floor of the fitness complex it was in a turrett and had lots of windows! We had a great time and afterwards went scrub shopping for the muggle job and for sushi and hibachi, where I had my first experience with Sake! It was actually pretty good! This past weekend on Saturday was a performance I have been preparing for for awhile, Pagan Pride Day!! I was asked awhile ago by Wild Sky Tribal to come down and perform as a guest with them, which I of course said yes to! I had only danced with one of the girls before, but that’s the beauty of ATS, you can just jump right on in there and go after it! I was awake at the ungodly hour of 8:30 geting dressed and my lovely bellydance wife drove to Dallas so I could get all my makeup on! And hair garden. And jewelry. I only wore 11 bracelets, 3 rings, 2 necklaces and earrings. Still could’ve had more on. 😉 I had my costume on, minus my bra and with a shirt over my choli and we were getting ready to leave as Amber asked what the temperature was like. I popped outside barefoot and with my short sleeve choli on and promptly scurried back inside for a sweatshirt! It was so cold! My choli being a loaner as I wait for my first custom one (by Cyndi!) I was cold! When we got down to Pagan Pride, I hopped out of the car to get my bra on and almost froze before I could get ym sweatshirt back on, plus my big heavy shawl! We were early and walked about for a bit, finding Zahra who was promoting the Witches Ball benefit that is being held November 1 and looking at a few of the vendors. We met uop with Taylor and one of the girls Stacy and wandered about a bit more, getting everything ready and ending up having Zahra save the day with a boombox for our music! We did a 50 minute set with a break in the middle. I danced a solo to Duma Sa Duma and got to do a duet with Taylor to Caravan plus, chorusing and dancing in the pod quite a bit. Afterwards Taylor gave a mini class to some of the spectators and they were very enthusiastic and cute! Pagan Pride was a fascinating experience for me. It was beautiful at the venue, a misty, dark, gray morning. The first thing we saw was a circle and drumming, some type of ritual was happening and veryone was just so happy, it made me happy. We danced on the circle stage which was made of concrete and was so cold my feet went numb during my solo! It was a great time and I had a blast getting to dance with my new sisters. I also, of course, had to peruse all of the shinies, and ended up buying a crystal, a ring with a beautiful big crystal in it and Amber bought me a necklace and earring set with a pink carved full moon on all three items. I met some lovely people and just generally had a blast. It was my first big ATS performance and solo and I was so pleased with how it went. I am working on getting the video uploaded soon! And the last bit of news. I have started two new companies. One is a fusion group named Avalouna which is comprised of Zahra Johnson, Cassandra Campbell and me. We will be doing a lot of experimental, fun stuff and just generally having fun in all different ways. Our first piece is a Voodoo/Witchy themed piece to premiere at Monster’s Ball, October 27. The second troupe is Callidora Tribal which is an ATS duet Cassandra and I have formed. We will also be premiering at Monster’s Ball and are very excited to finally officially be dancing together! Weekend Craziness and Dance Adventures! Wow! I actually had to take a day to process this weekend before I could write this post. This weekend was amazing and crazy and fun and exhausting and inspiring! It was pretty much one of the best weekends ever! Saturday it started with getting ready to head to Dallas to perform at The Event. I had been looking forward to this show for months and even though I was very sad to be unable to take the workshops, I was so happy when the lovely Aiyah Bree told me to go ahead, come on down and perform!!! I danced a brand new piece to “Bedroom Hymns” by Florence and the Machine, got to see some amazing performances and meet April Rose (who is such a sweetheart and I have a giant girl-bellydancer-crush on!) as well as see her and Edenia Archuleta perform. There were so many amazing performances and I only got to see the first half of the show! I was I could have stayed, but during intermission after a little milling about, talking to people and perusing the vendors wares (and sucking down some GLORIOUS lemon flavored water and buying an April Rose poster!) I had to leave to get back to Denison for my next show which was………..
AT A DRAG SHOW!!!!! I don’t know why, but I’ve always wanted to dance in a drag show and I finally got the chance for my good friend, the lovely Abbi Lee’s birthday drag show at The Goodtime Lounge. I got to see some lovely, talented queens and I danced to (wait for it!) Jump by Rihanna!!! I figured, how often do you get the opportunity to dance to a song like that and what better place than a gay bar?!?! (I wanted to dance to Applause by Lady Gaga, but one of the other lovely ladies had already claimed it!) Heehee! It was so fun! Ok, so I finally got home, scrubbed my face, at some leftover enchiladas and PASSED out! Got up Sunday, went and taught class and ran home to get half my face on before getting in the car to head to “Dalida and Friends” hafla. I love, love, love being a part of this show!!!!!! Dalida is one of the most amazing dancers I have ever met and the shows are so fun! I danced two pieces, one with a wine bottle as my dance partner and one very emotional, then fun piece to a song by Dikanda (one of my favorite groups at the moment!) and a song from the first Sherlock Holmes movie. The show was amazing! Badrawn, a middle eastern musical group from the Dallas area was there and kicked things off with Dalida dancing a wonderful Saiidi piece. Saiidi in a live band is a magical thing and I had chills so many times from their playing! I also got to meet an amzing drummer, El Lobo and we had a fun chat about tribal dancing and the connection between drummer and dancer. My lovely friend Zahra came to the hafla to see me dance and afterwards we had a fun dinner at Steak and Shake and celebrated me finishing my four performances with cheeseburgers and fries (but no shakes, sadly enough!). Home again and SLEEP!!! No, but really. I love Pinterest. Now of course I have the regular “Dream House”, “Food” and “I Really Do Love Muggle Knitting Patterns” boards just like the rest of the world, but I also pin A LOT of Bellydance stuff, from pretty pictures of awesome dancers to stretches to costuming ideas and makeup. Eeek! Tomorrow night is one of my favorite nights of the month! 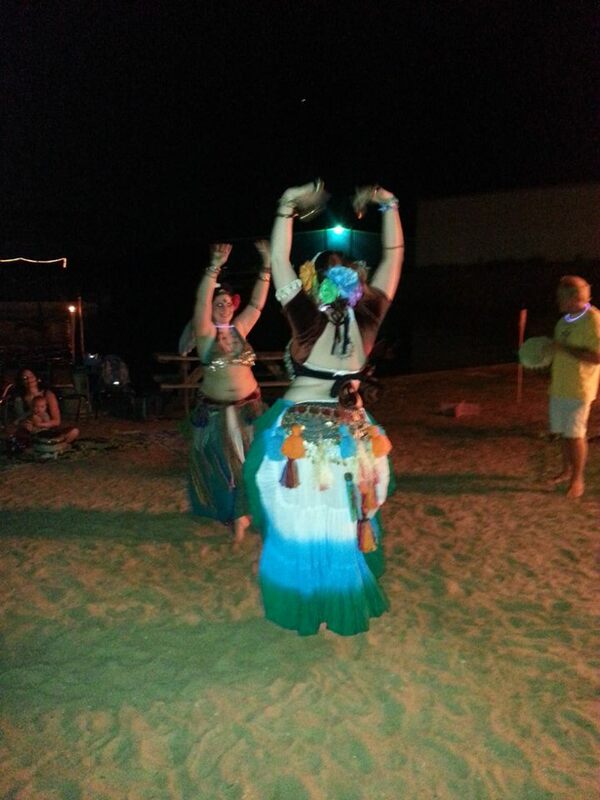 It is time once again for the Drum Circle Round the Moon at Little Mineral Marina in Pottsboro, TX!!! This is shaping up to be a pretty big event, a lot of out of towners popping in and a lot of drummers! The circle starts at 8pm, is family friendly and free and everyone is welcome to come! Did I mention it’s held right on the lake? Depending on where you sit, you could be three feet from the water! Cassandra and I will be there dancing along with some other lovely people! Come join us! It feels like far more than 5 days since I last wrote! I spent the weekend tending poor Amber who is sick with what turns out to be… MONO!! Really? Mono! Poor thing. Before we knew it was mono, I thought it was just another case of tonsilitis and popped over to the Green Market for some more homeopathic sore throat pills. While there I found a brand new store with all kinds of new goodies! Some of the best were Almond Dream icecream (dairy and gluten free and amazing tasting!) an amazing variety of couscous and the best was a new food bar where they have hot foods and cold and on the cold bar I found Dolmades (stuffed grape leaves) and a lovely array of olives! Oh and veggie chips! It was heavenly! They also had a wonderful selection of tinned soups (not the Campbell’s variety) and I saw an interesting new line of frozen foods that would be wonderful for taking to work. With those new finds I am over 5 days with no fast food! This may not seem like a big deal to some, but for a second shift hospital worker, the drive thru is often an easier choice than going home and cooking a meal, but I am determined to eat better and I am already feeling better because of it! I am very, very busy at the moment, preparing to start teaching again (THIS WEEK!!!! ), prepping for my upcoming 7 weekends straight of events and shows, and trying to get a new costume finished for the drum circle this month. Oh and stocking the Etsy store and picking performance pieces for my next three performances and umm sleeping. 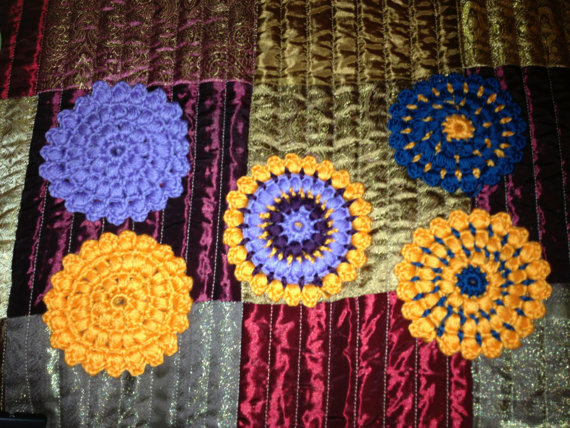 I have to admit, I’m a little obsessed with my little medallions right now. I love them! They are so cute and remind me of Tribal beaded medallions, plus I can make them in any color I want! And all different kinds of styles and shapes. I’m making a belt full of them as my newest ATS addition and plan on wearing it to the drum circle this month. Also I’m finally getting my Gillit Plate Tribal bra done and it will be premiered at the drum circle along with my new skirt! I love new pretties! So there it is. I still have so many things on my agenda to get done on the weekends it’s ridiculous! Like getting really awesome pictures of everything I have amde to go in my Etsy store. And finishing the rest. And finishing a present for my lovely friend and teacher Jeanne before I see her in two weeks! And being very lazy! Ahhh, but I really am very lucky right now. I can see this weekend on the horizon and am determined to cross more things off the list without adding more! New Performance Announcement! The Event Dallas! I am so thrilled to announce that after months of pining to perform at this event (Bahaha, see what I did there…and it’s called The Event…ahem), I will officially be performing at the show! It’s on Saturday, Sept 7, 2013 and there will be some big badass names there! Haven’t decided what I’m dancing yet, working on that this weekend, but I promise it’ll be fun! I’m also dancing at “Dalida and Friends” again in Septemebr, on the 8 and at A Sunday Soiree on the 15!! Wait…wasn’t September going to be a slow month for me? Ah well! No rest for the wicked I guess. Plus, I’d rather be dancing! Last night I had the great honor to perform at August’s “Dalida and Friends” Hafla in Plano, TX. The show is a monthly event produced by Dallas bellydancer Dalida. From a dancer’s perspective, this show was just so well produced and managed. We were able to get ready in the studio also housed in the Celebration Event Center and Ballroom and Dalida was a wonderful hostess, providing us with water and plenty of friendly chatter backstage. The venue itself is absolutely gorgeous. A lovely large dancefloor surrounded by tables was a great space to dance, especially with the backdrop of a fully mirrored stage platform and a very interesting architectural point- the red walls of the space are mirrored! The crowd was small this month, but it afforded a very intimate setting and I really loved the opportunity of connecting with every member of the audience. There were some lovely performances, Dalida started the show off with a beautiful fan veil routine, then Jere Luttner did a lovely, sassy double cane Saiidi performance. I was next with my 20’s modern inspired Fusion piece. I really loved getting to perform something so different from my set for the Masquerade Ball. This was upbeat, fun and I tossed in a nice drop just cause I felt like it! Shannon Varnado was next with a fabulous Egyptian routine and Saritza did a lovely performance and her costume was just fabulous. A lovely student of Dalida’s whose name I cannot remember did an adorable, upbeat song and last was another fusion dancer, Milli, who incorporated a lot of various styles into her piece, making a very interesting performance. Afterwards, we had a little break, Dalida came back and danced again and then another break and we all got up and danced, had a little dance contest which Milli won (go Milli!) and then finished the night with a wonderful, breathtaking Saiidi set by Dalida. She really is one of the best bellydancers it has been my pleasure to know. It was so fun to see people I had already gotten to meet (shoutout to Addison of Easy Street Images!) and to meet new faces as well! The Dallas bellydance scene is really making me feel welcome and there are so many talented dancers in the area! We finished the evening off with dinner with a couple of Dallas friends, then trekked north for a nightcap with some more friends. It was really an inspiring, rejuvenating night. I love being around people who love bellydance as much as I do, it just feeds some little part of me in a way nothing else can. And now I am getting ready for the next show, the next performance, always continuing the cycle. And I have been invited by Dalida to perform in the next “Dalida and Friends” show, September 8. I look forward to bringing something new (perhaps two?) and getting to see everyone again!